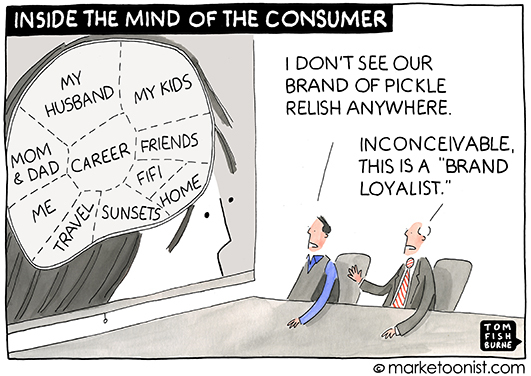 Don’t get us wrong, we love Tom Fishburne. And this is one of our favourites. We love it so much we have licenced it for our new website. It illustrates something that we think about a lot- egocentrism in business and the lack of empathy that is limiting creativity and the potential of ideas. Empathy is an innate characteristic in humans. But our business culture and models don’t seem to leave much scope for expressing it. The Marketing Directors Handbook describes research as a ‘valuable’ mechanism ‘to help champion and ‘hard- wire’ customer driven thinking in an organisation’ (p. 161). But, to be honest, it’s hard to see how Tom Fishburne could be quite so prolific if marketers and researchers were genuinely delivering on this promise. In a recent edition of Impact magazine, Unilever’s Keith Weed called for research to provide ‘inspiration and provocation’. Market research can’t be passive; it has to help marketers. Researchers need to understand people, rather than treating them purely as consumers. We couldn’t agree more. Thankfully the psychology literature also tells us that empathy can be strengthened through conscious effort and focus- it’s called self-regulation and mindfulness…….we will say more about that another time…….. But this is where we believe the real transformative power of research lies. This isn’t about new technology. It’s not about method. It’s about a new shared purpose and commitment to embracing the world as it really is. It will be messy. But it will be fun!